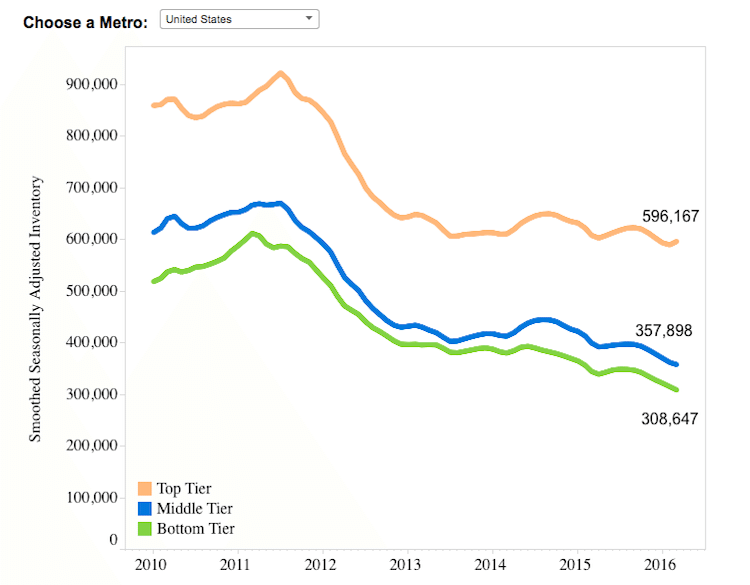 Zillow recently released its Q1 2016 Market Report, noting that inventory across the nation has dropped almost 6 percent annually, with over 10 percent decreases in both bottom and middle-tier homes. The real estate website estimates the national Zillow Home Value Index (ZHVI) at $186,200 in the first quarter of 2016. There are 5.9 percent fewer homes for sale in the U.S. than a year ago. There are 10.4 percent fewer entry-level homes for sale in the U.S. than a year ago. Low supply is driving up home prices among entry-level homes, which are often sought after by first-time buyers. National home values rose 4.8 percent to $186,200, according to the first quarter Real Estate Market Reports. Rents rose 2.6 percent to $1,389. Despite seeing a small uptick in inventory for top-tier homes at 1.3 percent in the first quarter of 2016, the Los Angeles metro area lost a good chunk of inventory in other tiers, with bottom and middle-tier home inventory dropping 26.3 and 11.3 percent. 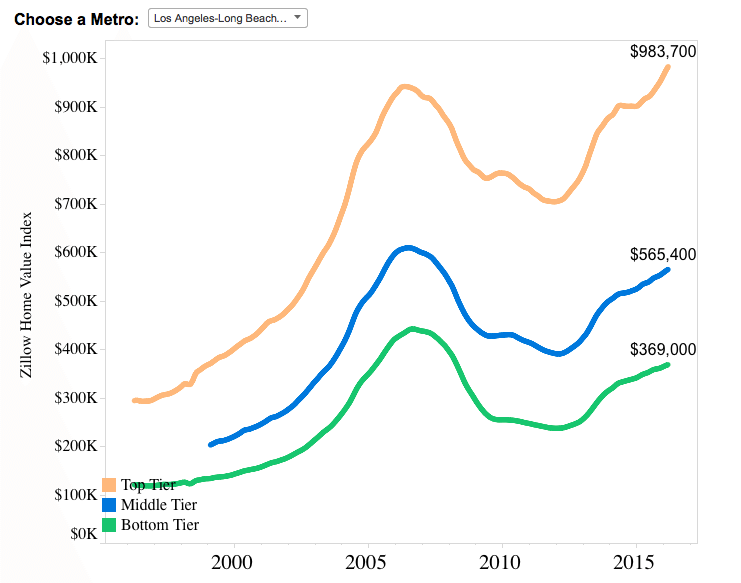 Although its inventory may be lacking, L.A. metro’s home values are nothing to sneeze at, with a bottom-tier ZHVI at $369,000 in the first quarter — more than $80,000 higher than the national average ZHVI, which spans all tiers. 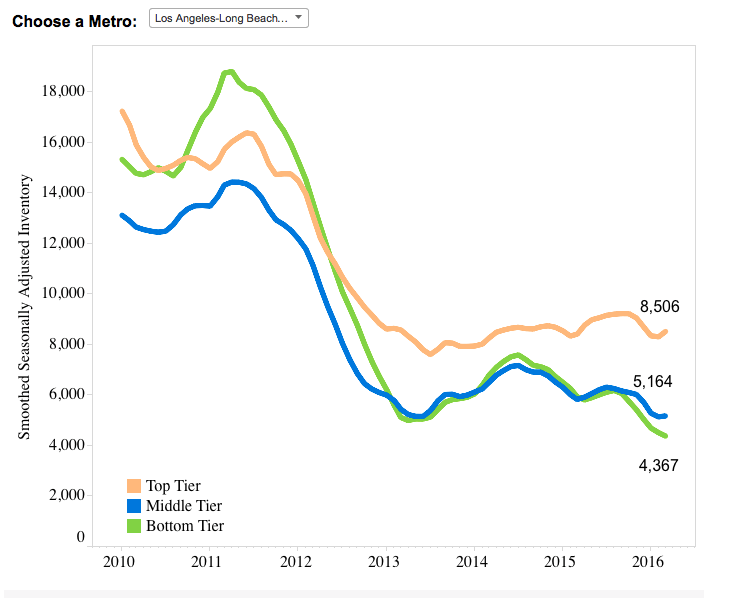 All home tiers in L.A. metro increased in the first quarter, with both bottom and middle-tier home values increasing 6.2 percent and top-tier home values going up 8.1 percent. The average ZHVI in the first quarter was $565,400.